Nigeria's president makes daily profile updates on Facebook and has nearly a quarter of a million friends. (CNN) -- At over 246,000 and counting, he has more Facebook fans than the combined tally of British Prime Minister David Cameron, German chancellor Angela Merkel, and South African head of state Jacob Zuma. Since Goodluck Jonathan, Nigeria's president, created his profile in June of this year, rarely a day goes by without a fresh update -- which appear to be written by Jonathan himself -- concerning recent news events, government policy and, of course, the coming elections. He also seized public momentum and stole a march on his rivals by choosing the hugely popular social networking site to announce his standing for the forthcoming presidential elections in 2011. "I Goodluck Ebele Jonathan by the grace of God hereby offer myself and my services to the Nigerian people as a candidate for the office of President" read his Facebook status on September 15, ending a long period of speculation about the likelihood of his candidacy. "This is the first time in our country that Facebook has ever made the headlines of a national newspaper," Chude Jideonwo, founding member of influential Nigerian activist site Enough is Enough, told CNN. Jideonwo notes that the surprise announcement was made at precisely the same time that one of Jonathan's main presidential rivals, former military ruler Ibrahim Babangida, put his own election hat into the ring. "Many people believe this was a strategic move to overshadow Babangida's announcement -- and if it was, frankly, it worked," said Jideonwo. "Again I spent time reading your comments and yesterday a youth named Toyin Dawodu indicated that he had an idea for a project that could deliver 4,000 MWs of electricity ... Toyin, someone from my office will make contact with you regarding your idea. I know I can not attend to every comment or suggestion due to time constraints, but please do know that I read them and they influence my actions." It's this direct and personal form of interaction that seems to be endearing the Nigerian president to his country's growing young and web-savvy electorate. 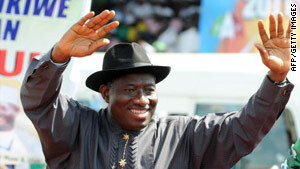 Each new post from Jonathan attracts thousands of comments and some have garnered in excess of 6,000 responses. "What distinguishes Jonathan from other politicians is that he seems to have genuinely embraced Facebook," explained Jideonwo. "You can consistently hear his voice in the posts and it feels like he is really trying to communicate with the voters -- this is what makes him so popular." With a population of over 150 million, Nigeria has just fewer than 44 million internet users, according to internetworldstats.com, and of these 1.7 million are on Facebook. While this represents Africa's biggest internet market, as well as the continent's largest Facebook user base -- the numbers make up only a small proportion of the overall electorate. Is it too soon then for social media platforms to play a meaningful role in Nigerian politics? "What you have to bear in mind is that there is a critical minority of opinion leaders on Facebook -- local business CEOs, young activists, and university graduates," Ken Banks, founder of kiwanja.net, an information technology site that provides support for NGOs, told CNN. The president's high profile on the world's biggest social network has not, however, escaped criticism. In a post that made international headlines, Jonathan claimed that a decision to reverse his proposed two-year suspension of the Nigerian football team following their early exit in the 2010 World Cup Finals was prompted by a wave of opposition from his Facebook followers. But, as Nigerian journalist Tolu Ogunlesi told CNN: "The fact is his hand was forced by FIFA regulations preventing political interference with the national football team. His comments on Facebook were really just to protect his image." For some, this is a worrying reflection of the incumbent president's use of social media to, perhaps cynically, bolster his election hopes. "It's obvious that this is a calculated attempt to win the heart and minds of Nigerians who are active on Facebook, in a bid to secure electoral victory," Nigerian Internet entrepreneur, Oluniyi Ajao, wrote in a recent post on his popular blog. Similar criticisms have been voiced by a number of the Facebook users Jonathan is attempting to engage: "We are tired of rhetoric, what we need is action," wrote one commentator in response to a post concerning Nigeria's frequent power shortages. But, for the time being -- at least as far as Facebook is concerned -- any disparaging remarks are drowned out by a bellowing chorus of support. "Whatever his motives," Jideonwo concluded, "the president has opened up a new channel of popular involvement in Nigerian politics, encouraging young people to feel like they have a voice. This can only be a good thing."